Well established and identified boundary lines are important to all landowners. Far to often boundaries are given a low priority by owners and this can be a very costly mistake. 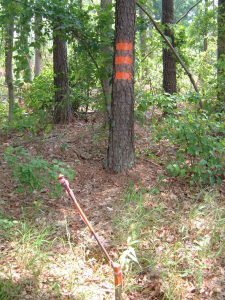 The most cost effective method to maintain property boundaries is to mark trees every 30-50 feet along the perimeter of the ownership. The marked trees are then painted with boundary line paint. Well marked boundaries can provide many benefits and help prevent costly encroachment and trespassing.